How unusual is it to find a public transportation system that refunds money when a customer mistakenly chooses a wrong entry? Though the Opal card (named for Australia's top selling gem) in use for nearly all Sydney ferries and trains does just that, and does it automatically. Wonders abound in this city down under, as well as across the country at large. Australia is a better America, a warmer Canada, boosters never blush to say. Who can resist a country that harbors such place names as Woolloomooloo. So-called aboriginal/indigenous names atop Veddy British ones - streets named after central London, for instance. Paddington, Oxford St., etc. In conversation, there is apt to be a hint of formality atop the matey-by-crikey manner. A delightful mix. I'm a booster after a mere three weeks walking Sydney's streets and bouncing around the outback, moving across the northern border from Broome (world's major exporter of cultured pearls, among other odd and unusual facts concerning that town) in WA ( Western Australia, the state), NT (Northern Territory) and a piece of Q (Queensland), by planes big and small, canoe, jeep, and a camouflaged made-in-Australia Humvee-like vehicle known as the Oka. (Pronounced, strangely as is often the case with many sounds down under, AH-ka) foraging streams and rutted roads deep enough to hide a wallaby. What makes up the special charm of the place - a country as large as ours with only 24 million people? A contagious open-hearted friendliness, for one. At least as a foreign visitor sees it. Maybe the relatively small population in so large a continent creates a certain degree of trust, between friends and strangers alike. Credit the country with mandatory voting, a government-run health service, strict gun control laws, and one of the highest minimum wages in the world and no wonder the goodwill about. Language itself, at least in the wild, is inventive in many ways. Guides in the outback term senior travelers 'gray nomads,' the really infirm using walkers are 'zimmerframers,' and do-good environmentalists are 'hairy armpits' - touching affectionate words for the most part. A meal is bush tucker, a damper is a baked bread-and-cheese combo. The Bark Inn (why bark? 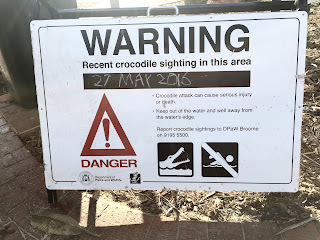 no dogs around that I could see - but the paperbark tree is everywhere) offers 'croc, buff and barra' - short for crocodile (not worth it), buffalo burgers, and barramundi - local fish found in profusion. Australia has two seasons: wet and dry. In wet seasons (our winter, their summer) rivers gush wildly and can strand the unwary for months in a remote location.Extremes seem the rule when it comes to tackling country roads. Witness the measuring stick, meters high, found on either side of a river to warn oncoming cars just how high the water is trending. 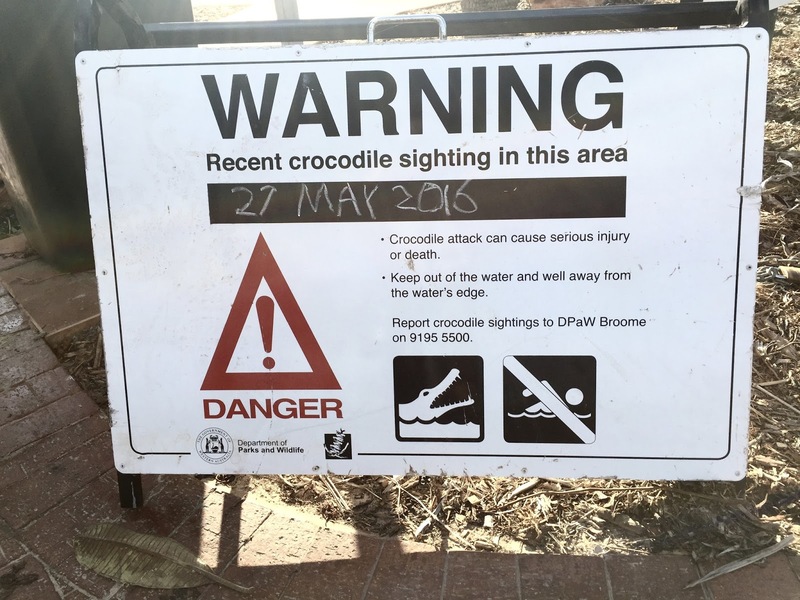 A crocodile went sailing over one such low lying roadway before we could cross in our 4WD. This ramble was meant to be a hymn to Sydney's grit and glories, as well it might be given its sensational location by the sea. A toast to its native charm. Where else is there a zoo across the water that takes visitors to the entrance on a vertical gondola. A modern condo-office building with a horizontal overhang 20 or more stories high that is engineered to respond to changing daylight and avoid throwing shadows on the garden below? In Sydney the first time I stayed at a friendly boutique hotel called HarbourRocks, the site of the city's first hospital way way back in convict days (settlers having been shipped there from England, though first foreign visitors to the country are said to have come in the late 17th century way before Captain Cook on the Endeavor did a century later). Smart restoration included scaling back to the original walls and then decorating hallways with photographs of the job. My last night I spent at Accor's Mercure Airport Hotel where the friendly check-in-lady pronounced the 'le' in Le Club as 'lee," perhaps imagining that I would prefer to pronounce it that way. Such is the way of many courteous thoughtful Australians I met in such public venues as trains, hotels and restaurants. A nation of happy people? Well, not entirely. Immigration is a sore issue, a harsh one.Treatment of aboriginal peoples has a long sorry history, now only slowly being rectified.